Epsom salt has dozens and dozens of uses which includes many health benefits. Among all one such imperative use of Epsom salt and why the world has gone gaga and over exaggerated the product is introduction of Epsom salt bath. This is one of the in fine fettle uses of Epsom salt which has proved infinite number of benefits to the beauty regime. Epsom salt is made up of magnesium sulfate, and this was discovered in the Epsom, England and hence it was named as Epsom salt after the place of discovery. Magnesium and sulfate both plays an important part in many ways in human body. Here we have brought you a list which will get you acquainted with the benefits of having an Epsom salt bath. 1. Scrubs the Body: Epsom body salt consists of magnesium sulfate and calcium which helps to exfoliate the skin well and also remove the dead cells accumulated on the skin. Many of the beauty salons have the facility of giving Epsom salt bath. 2. Cleans the Skin: Epsom salt can be a good exfoliator, which helps to restore the damaged cells and also helps repair them too. Getting an Epsom salt bath helps to clean the body deeply and also provides relaxation. 3. Soften the Skin: Epsom salt is a great ingredient which helps to soft the skin and also helps to improve the texture of the skin. It helps to kill the germs and bacteria on the skin. An Epsom salt bath helps to improve the condition of hardness on the skin. 4. Improved Heart Condition: Yes, Epsom salt bath helps to improve the heart condition of the person. It is enriched with all the goodness of minerals and essential vitamins which reduces the risk of heart attack. 5. 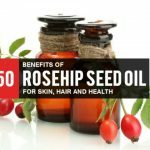 Boost Blood Circulation in the Body: On an average it depends on you what is the time required for the Epsom salt bath and how much you are dedicating towards it. Epsom salt bath helps to boost the blood circulation in the body which helps to keep you fresh and energetic. 6. Moisturizes the Body: Epsom salt bath helps to moisturize the body. The calcium and magnesium present in the Epsom salt acts as a detox ingredient which helps to retain the essential oil present on the body and also maintain the moisturization. 7. Retains Hydration: Epsom salt bath helps to retain the hydration level in the body. The Epsom salt helps to maintain the ph. value which leads in balancing the body content in the body. 8. Restores Elasticity: Magnesium sulfate known as Epsom salt also helps to restore elasticity of the skin. Epsom salt makes it easy for the body to observe it quickly and also replace the damaged cell rapidly. 9. Regulates Heart Beats: Researches have proved Epsom salt benefits have helped to regulate heart beats. Epsom salt helps to keep heart in good condition and starts regulating heartbeat. 10. Helps to Lower Blood Pressure: Epsom salt has numerous health benefits and the most important among them is lowering blood pressure. Taking an Epsom salt bath helps to lower the pressure and supports it to maintain it stable. 11. Treats Post Workout Swelling: The most important thing to consider is relaxing your mind and body. After post workout, you may see swelling in some parts of the body which may be due to leading cause of hot baths. Epsom salt bath helps to reduce the post workout swelling. 12. Trigger Points: Trigger points and muscle points is increasingly recognized by many of the health scientist. Relieving the muscle pains is one of the benefits of getting this hot bath done. 13. Relives Body Pain: An Epsom salt bath is known to relief body pain and also reduces inflammation throughout the body. 14. Relieves Migraine: Migraine is a problem when headache of the individual reaches a second next level. An Epsom salt bath can help you to treat migraine condition and also lower the frequent attacks. 15. Releases Foot Odor: Dirty and stinky foot odor can be most disconcerting moment for the person. Epsom salt helps to get rid of this problem and reduce the odor subsequently. 16. Treats Asthma: An Epsom salt has also proven its effect on treating bronchial asthma of the person. To treat this condition you need to take just 15 minutes of hot bath every day. 17. Reduces Body Odor and Sweat: Epsom salt not only helps to relief from foot odor but it also helps to treat body odors and also help to control the glands which results in producing sweats. 18. Ensures Proper Functioning of Muscles: According to many researches and studies, Epsom salt helps to control the electrolysis in the body which ensures proper functioning of the muscles in the body. 19. Formation of Insulin: The magnesium and sulfate present in the Epsom salt helps to maintain the proportion of insulin in the body which reduces the risk of diabetes too. 20. Helps to Heal Cuts: Due to its antibiotic properties and rich in minerals, getting an Epsom salt helps to heal any minor or major cuts on the skin. 21. Treats Soreness: Some of the people suffer from soreness on their skin from childhood. Besides proper medicines and pooping up tables, taking an Epsom salt bath can help to reduce the soreness. 22. Maintain Electric Impulses: The potassium and calcium present in the body helps to maintain the electric impulses in the body. Calcium serves as the main conductor of the body impulses. 23. Improves Digestion: The minerals present in the Epsom salt helps to secret the effective enzymes which results in good and health digestion in a human body. 24. Improves Nervous System: Magnesium helps to maintain the proper calcium in the blood and calcium helps to maintain the proper electrical current in the body. Hence, Epsom salt bath can help to improve the nervous system. 25. Relaxes Mind: Magnesium and calcium are the main ingredients which help to boost the immunity in the body and also ensure the well being of the mind. 26. Improves Oxygen Flow: During Epsom salt baths, Epsom salt to get absorbed rapidly with the skin, which helps to boost the oxygen flow in the body and also maintain the energy level. 27. Improves Absorbing of Nutrients: Epsom salt gets easily absorbed in the blood which ensures the flow throughout the body. It also results in increased absorption of nutrients in a human body. 28. Improves Brain Tissue: There is a time when pregnant women start losing their brain tissue and also lack in energy and vital nutrients. Getting a Epsom salt bath helps to improve the building brain tissues and restores the energy level. 29. 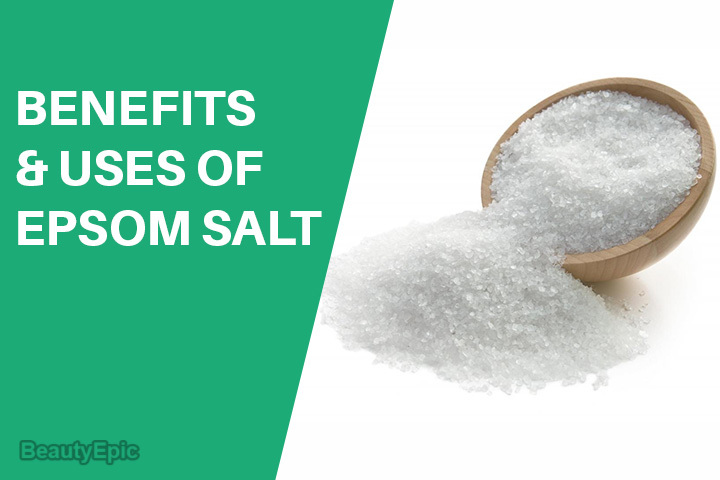 Reduces Blood Clots: Due to the sulfate present in the salt, it helps to keep the blood flowing continuously in the body which reliefs from blood clots. 30. Prevents Hardening of Arteries: Numerous studies are relevant that Epsom salt helps to prevent hardening of arteries. Besides enabling proper body functions, it helps to prevent arteries from getting swollen and hard. 31. Eliminates Toxins From the Body: Sulfate present in the Epsom salt helps to eliminate heavy and unwanted metals from the body. As all the heavy metals are flushes out of body, and the body trigger 3 times more energy than usual. 32. Relieves Constipation: The salt helps to increase the water content in the intestine and brings out temporary relief from constipation. Getting a Epsom salt bath helps to relieve constipation only on temporary basis. 33. Treats Athlete’s Foot: Epsom salt bath helps to treat athletes’ foot. Just lowering foot in Epsom salt water for 15 minutes helps to relief the condition. Taking an Epsom salt bath at home is a great idea for detoxification of the body. It helps to scrub the body deeply and stimulate blood circulation throughout the body. Now you don’t need to burn big hole in the pocket, so now you don’t need to get in the saloons. We have brought you some simple steps which can help to take advantage of Epsom salt bath right back at home. Step 1: Fill your bathing tub in some hot water and you may use chlorine filter if needed. Step 2: Now add Epsom salt to the hot water which will make it dissolve completely in the water so that the body absorbs the minerals quickly. You get Epsom salt bath in standard size boxes or bag in general stores on online. You may add 1 or 2 cup of Epsom salt depending upon the water in the tub. Step 3: Add1/2 cup of baking soda to the Epsom dissolved water. Baking soda helps to boost Epsom salt which helps to clean the body deeply and thoroughly. Step 4: Add fresh ginger tea in the tub. This is specially recommended for people who tend to perspire a lot and also release body odor. Fresh ginger tea in the water acts like a astringent which helps to reduces the perspiration of the body and also make you feel fresh. It also helps to keep you away from various infection diseases and also effectively combat stinky feet’s. Step 5: Adding some essential oil to the bathing tub helps to add benefit to the body. Now it depends on you, which essential oil is to be added to the water. You have wide array of essential oil ranging from lemon grass oil to rosemary oil. Step 6: You should at least target to take the bath for 40 minutes and you can continue doing this for a minimum of 20 minutes up to 40 minutes. Start scrubbing your body with a body scrubbing or pumice stone. This helps to remove the dirt from the body and also makes sure that minerals are absorbed by the body. Step 7: Play some interesting music so that you enjoy the bath at home and you are not bored with it. Try to extend it up to 40 minutes, so that you are benefited with the Epsom salt bath to the most. Step 8: If you feel the water hot which is not suitable and bearable by the body, try adding cold water little by little to the hot water. Make it sure, that the water is not much cold, because it won’t help to detoxify the skin and scrub it well. Step 9: Step out and pat dry. You are using Epsom salt in the water, so there may be chances for you to feel irritating or inflammation on the skin. If you feel some, you can apply some moisturizer or aloe Vera gel over skin. Step 10: Drink lot of water. Once you have completed the Epsom salt bath. It is important to rub out the heavy metal or toxic elements in the body. It gets flushed way by drinking water. Step 11: You might have to rub your body with Loofah or bar which helps to aid the toxins on the surface of the skin. Step 12: Voila! You are done doing Epsom salt bath at home. Epsom salt bath encourages removing the toxins from the body and also used to detoxify the skin. Due to various benefits in the beauty regime, the world has gone gaga over this newly introduced bath. Not to forget adding some essential oil to make this bath more pleasant. Have a happy Epsom salt bathing! How to Use Baking Soda for Blackheads? Coconut Oil for Feet – Why It’s Good for Your Feet? How to Use Epsom Salt for Constipation Relief? 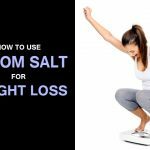 How To Lose Weight With Epsom Salt?